In a new article in Physical Review Letters, Eugene Gregoryanz and his colleagues from Geophysical Laboratory and HPCAT at the Advanced Photon Source, Argonne National Laboratory report on the behavior in sodium when squeezed to 1.2 million atmospheres. 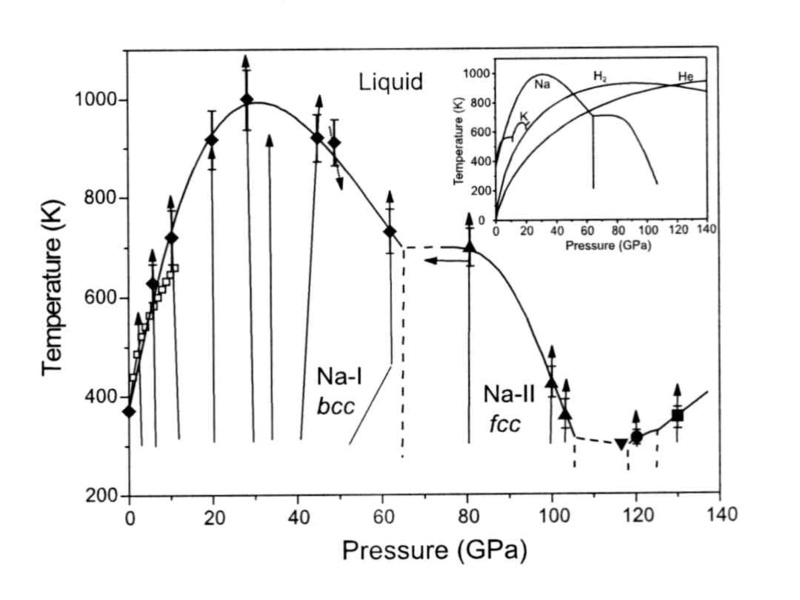 High-pressure high-temperature synchrotron diffraction measurements reveal a maximum on the melting curve of Na in the bcc phase at ~31 GPa and 1000 K and a steep decrease in melting temperature in its fcc phase. The results extend the melting curve by an order of magnitude up to 130 GPa. Above 103 GPa, Na crystallizes in a sequence of phases with complex structures with unusually low melting temperatures, reaching 300 K at 118 GPa, and an increased melting temperature is observed with further increases in pressure [Gregoryanz et al., Phys. Rev. Lett., 2005].